Perfect Blue (1997) is feature film debut from director Satoshi Kon, the brilliant man behind the more recent Paprika (2006), and as such the two movies share a lot of similarities. They both directly confront the thematic dichotomy of fantasy and reality as well as dealing more tangentially with issues like identity, obsession, and the influence of culture. The most noticeable difference between the two is in the quality of the animation: Perfect Blue undoubtedly has several stunning visuals, but when it comes to the busier moments some of the background detail is lost. The crucial point to make about a film like this is that the temptation to play detective and uncover whether Mima is a schizophrenic murderer or which scenes are reality and which fantasy is a misleading one. The point is rather to immerse yourself in the confusion of it all, to feel the same uncertainty that Mima does, and ultimately to lose your confidence in (the appearance of) reality. The events of Perfect Blue at the simplest level depict a pop singer named Mima who decides to become an actress and slowly has a mental breakdown. As she becomes more involved with her acting career she progressively loses track of what is real and what is not, and as this process continues it becomes increasingly difficult for the audience to discern what is happening "in the real world" and what is happening "in her head". This is a false dichotomy, however, because ultimately everything only happens "in her head". Instead of depicting a straightforward plot with definite events, Perfect Blue portrays visually the inevitable psychological uncertainty underlying identity as such. Through the film's narrative, Mima experiences the same struggle to define herself that we all continually deal with. The point is not to "figure out" the events of the film, but to realize that the film itself is a visualization of a psychological phenomenon. And of course this is just one reading among many. - According to Darren Aronofsky, Perfect Blue was one of many influences behind his films Requiem for a Dream (2001) and Black Swan (2010), and the director now owns the American filming rights to the movie. 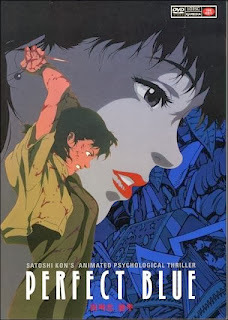 - Perfect Blue was originally set to be a live-action, direct to video series, but the budget was cut after an earthquake damage the studio (ref). For what it's worth, I couldn't be more pleased with the result. - TotalFilm ranked Perfect Blue as the 25th best animated film of all time. I watched this movie once, but I can't remember anything about it. Supposedly there's a sexual assault, but I don't even recall that. Japanese animation is pretty hit and miss with me. 'Ghost in the Shell' didn't interest me, and who knows if I'll like 'Akira' if I ever get to watch it. I grew up with 'Dragon Ball Z' and though the animation was flashy in a repetitive way, I liked the storylines. But I feel like I'm missing out on some good Japanese stories sometimes by staying away from anime. Yeah high quality anime generally works for me but I never seek it out specifically. I like Hayao Miyazaki and Satoshi Kon, but they're just great directors who happen to work with great animators. I personally love Akira. There was a week a little while ago where I watched it every day. The story is strange since it's the kind of thing where the protagonist doesn't shape events around him as much as he is simply caught up in them. I watch it because the world it creates is awesome, not because the characters are particularly striking (although they certainly work well enough). Hope that helps!